The 22 Magnum cartridge fires the same diameter projectile as the more familiar 22 LR but it does so at significantly higher velocity which frequently increases the effectiveness of the bullet. Typically known as a varmint and small-game hunting round, when shot from a rifle the 22 Magnum lethality at the muzzle is equivalent to a 223 Remington hit at 350 yards distance. Plenty enough to physically deter an attacker but not powerful enough to use for humane hunting of larger animals. Many people choose this cartridge for self-defense in the form of the NAA Mini-Revolver. While the revolver itself is a great firearm, the choice of caliber leaves much to be desired for such a short barrel length. 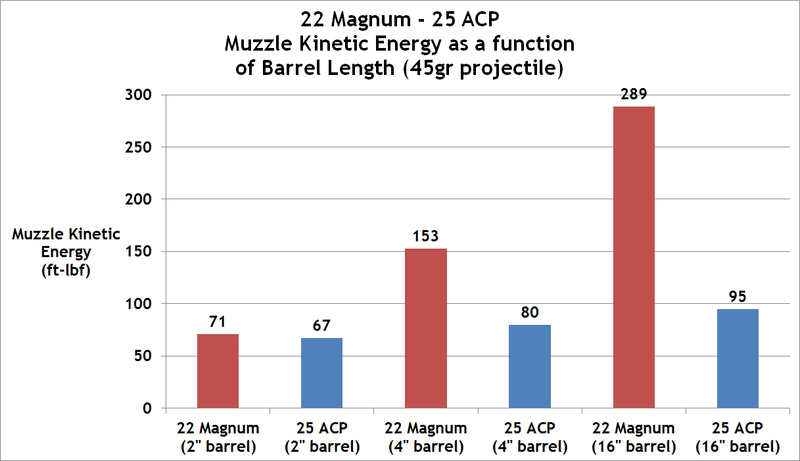 As seen in Figure 1 (courtesy of: Ballistics By The Inch ), the muzzle velocity from a 22 Magnum increases greatly with barrel length. A 25 ACP increases much less in velocity as the barrel length is increased. All conventional small arms cartridges use regressive burn propellant to push the bullet down the barrel. As this type of propellant grain burns, a smaller surface area is presented to the flame. With a smaller surface area exposed, less chemical energy is converted into kinetic energy driving the bullet. On the one hand, there is a diminishing return of velocity gain versus barrel length (once the optimal barrel length is exceeded.) The other side of it is the limitations on chamber pressure imposed by the material limits of the brass (or mild steel) of the cartridge case. The chamber pressure and acceptable propellant types are standardized for a cartridge so that the pressure inside of the cartridge case is low enough upon extraction from the chamber (and simultaneous loss of the structural reinforcement of the barrel) that the cartridge case does not rupture and cause damage to the shtheooter or gun. For the 22 Magnum, the SAAMI Maximum chamber pressure is 24,000 PSI. 25 ACP (used in the example above) is 25,000 PSI which is functionally identical to the 22 Magnum. 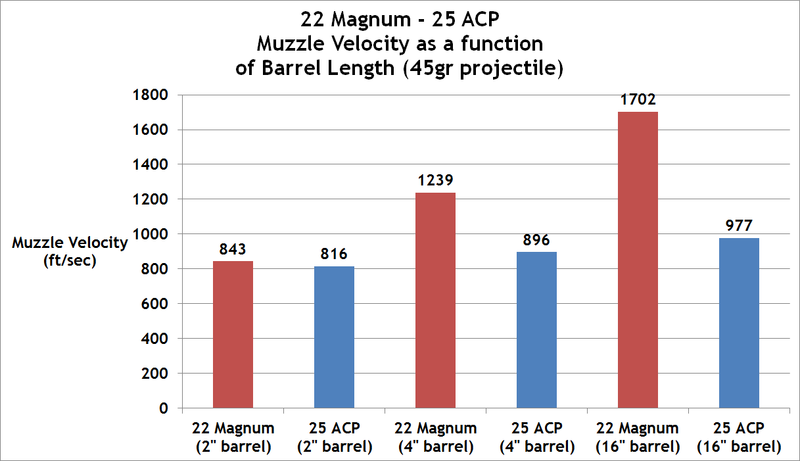 The difference in muzzle velocity change as a function of barrel length is due to the fact that 25 ACP cartridges use pistol propellant and 22 Magnum cartridges use rifle propellant. Rifle propellant has a greater amount of burn deterrent added into the grain and it needs a longer barrel length to make use of this. Using a greater quantity of burn deterrent allows the propellant to stay within safe pressure limits at all times while generating propellant gas down the entire length of the barrel. Pistols are assumed to have a short barrel so the goal with pistol propellant is to deflagrate the propellant as quickly as possible while remaining under the established limits for Maximum Pressure. Do not expect rifle ammunition to perform similarly in a short barrel as it does in a rifle-length barrel. A similar challenge arises when finding expanding ammunition that both expands and penetrates to a significant distance when using a handgun-length barrel. Velocity is what drives the fluid pressure needed for expanding ammunition to expand .. rifle length-barrels produce a much higher velocity than the handgun-length barrels so it is reasonable to design the expanding ammunition to function at the higher velocity and hopefully at the lower velocity as well. Manufacturers including Hornady, Speer and Winchester have made 22 Magnum cartridges with projectiles that are designed to expand when fired from a 22 Magnum handgun. We have tested the Hornady 45gr Critical Defense load from an NAA Mini-Revolver and the bullet expands reliably in gelatin. Barring further testing on the Speer and Winchester cartridges, we recommend the Hornady load for the Mini-Revolver. Under no circumstances do we recommend the use of the ‘rat shot’ shotshell cartridges for self-defense usage.